Mao-era foreign friends poster In less than 20 years China is expected to have the largest economy in the world. Once its army is modernized it also has the potential of becoming a military superpower. Beijing has traditionally made policy decisions based on domestic concerns rather than foreign ones. But in recent years as it stature, wealth and role in the global economy have risen China seems more intent on making decision with foreign policy goals in mind and using its power abroad. China is not really perceived as international threat namely because its military is not strong enough to project itself outside of China and it has too much to lose economically if it makes trouble abroad. China has said it has no ambitions of taking over territory beyond is borders other than Taiwan---which it regards as within its borders---in part because it has its hands full dealing with problems at home. China also has to deal with the fact that is dependant on the outside world for energy and other resources. China often tries to ally itself with the developing world and offer itself as an alternative to the West. 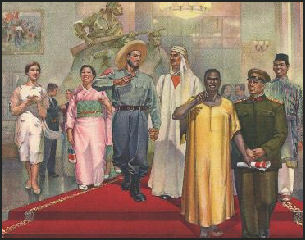 Under Mao, many poor countries found China to be an inspiration. Today China supports efforts to give developing nations a greater voice in the United Nations. There are some concerns in the West that developing nations may adopt the Chinese model to success---promoting economic growth while clamping down on political freedoms and human rights. These days China is trying to promote itself as a kinder, gentler nation. In 2004, Hu Jintao introduced the foreign policy ideology “China’s Peaceful Rise”---embracing globalization while avoiding a Cold War-style confrontation with the West. The expression was later modified to “peaceful development” because “rise” was seen as sounding too aggressive. In economic, political and diplomatic circles, often it seems that China is all anyone wants to talk about. China was at center stage of the Davos World Economic Forum in January 2006. That year more that half of the leaders of the world’s 192 countries visited China. China is increasingly being seen by the United States and Europe as obstructionist when it comes to issues like global warming and Iran’s nuclear program. China only has extradition policies with 37 countries. In a survey by Pew Research Center in 2008, 77 percent of the Chinese asked said they thought that China was generally liked around the world. In a survey by Pew Research Center in 2009, only seven in 23 countries polled had majorities that had favorable impressions of China. Five countries viewed most positively in another survey were: 1) Canada (54 percent); 2) Japan (54 percent); 3) France (50 percent); 4) Britain (45 percent); 5) China (42 percent). The number of people in Britain, the United States, France, Germany and Spain with a favorably view of China plunged between 2006 and 2008, with the decline as particularly notable, dropping from 60 percent in 2006 to 28 percent in 2008. In 2007, the percentage of the population in the United States with a favorable opinion was China was 40 percent, compared to 48 percent in Britain, 47 percent in France 39 percent in Spain, 36 percent in Germany, 60 percent in Russia, 36 percent in Japan and 23 percent in Turkey. Mao had ambitions to expand his revolution abroad. Under his rule, China entered foreign adventures in Korea, Vietnam and Cambodia; clashed over borders with the Soviet Union; cast the United States as a global villain; and launched a number of development projects in Africa and other developing nations. During much of the Maoist era, China’s closest ally was Albania. Unlike the Soviet Union, China today is no longer in the business of exporting its ideology. Unlike the 19th-century European powers, it is not looking to amass new colonies. Foreign policy under Deng Xiaoping was characterized by the dictums “hide you ambitions and disguise your claws” and “lay low at a time of diversity,” which were taken to mean that China should devote its energy to developing economially and not concern itself with international affairs. These days China pushes itself more as a responsible even sympathetic “great power.” One reason for China’s new friendly face relates to its position as major economic power and its need for other nations to buys it products and invest money. 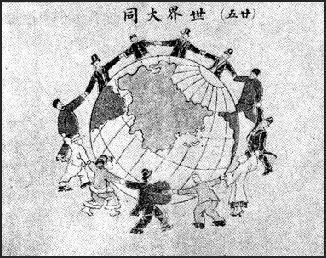 It widely believed that welcoming China into the community of nations will force it to abide by international standards, rules and laws. China now has a presence almost everywhere in the world. It has worked trade agreements in Latin America; signed oil deals in Central Asia, the Middle East and Russia; and is engaged in infrastructure projects in Africa. And because China is so big it is involved in economic, social and political sectors that have an impact on the entire global community. Suffering and humiliation at the hands of foreigners was a theme in Chinese history in the 19th century and 20th century. In the Opium Wars era, Britain subdued the Chinese population with Indian opium; made tons of money; and took over Chinese territory with humiliating unequal treaties. Later, the Russians and Japanese occupied the industrial north; European nations established "treaty ports" on the Chinese coast to exploit China's resources and labor; and, finally, Japan raped and pillaged China like medieval invaders before and during World War II. The Chinese describe their feelongs with the word guochi, or "the national humiliation." In the early 19th century Napoleon said, "Let China sleep when she wakes the world will be sorry." At that time misery and rebellions caused by overpopulation and an inefficient dynasty resulted in famines and wars which left tens of millions dead. Foreigners were aware of the way China was being exploited. In 1900, the future Russian revolutionary leader, Vladamir Lenin, said, "The European governments have robbed China as ghouls rob copses." A descriptive 1898 French lithograph showed Queen Victoria of Great Britain, Kaiser Wilhelm II of Germany, the Japanese emperor Mutsuhito and Czar Nicholas II all sitting around a giant pizza, inscribed with China, dividing it up with butcher knives. In 2001 the National People Congress proclaimed a “National Humiliation Day” but because there were so many historical dates that could be used delegates could not agree on a single one. Some have argued that China’s internal demands and problems are so great that China’s impact on the world and global policy will be limited except where they help solve internal problems’such as procuring natural resources---and China will not be a major foreign policy player like the United States or even Europe until it gets its domestic issues sorted out. If China becomes too absorbed in foreign issues it runs the risk of overextending itself and if it does that it does so at its own peril by risking losing a handle on internal problems. For that reason China must rely and become comfortable with the United States playing the role of global regulator because the U.S. protects interests and markets that China depends on. China’s influence in the world has the risen as the influence of the United States has shrunk, especially after the U.S. has gotten bogged down in Iraq and lost respect and credibility for the way it handled things over there. In March 2005, a BBC survey found that 48 percent of the people asked in 22 countries had a positive view of China as a global power compared to 38 percent with a positive view of the United States. “The final part of the book has a distinctly elegiac feel, as if Kissinger is worried that the rise of a new assertive nationalism in China along with "yellow peril" populist rhetoric in the US may undo the work that came from that secret visit to Beijing in 1971. His prescription  that the west should hold to its own values on questions of human rights while seeking to understand the historical context in which China has come to prominence  is sensible. But policymakers in Washington and Beijing seem less enthusiastic about nuance than their predecessors. The hints and aphorisms batted between Zhou and Kissinger have given way to a more zero-sum rhetoric. Jacques then goes ahead and paints a world in which China is dominant culturally and politically. He visualizes a world in which the yuan and Mandarin will replace the dollar and English as the world’s dominate currency and language; where Confucianism replaces Western philosophies as the underling pining of society; and where Chinese historical events, literature and film become known to everyone. "China, in this account, is not a mere nation-state, as Europeans understand it, but a “civilization state,” with an abiding and transcendent sense of unity, a shared attitude of racial solidarity, and an overwhelming belief in its cultural superiority. Its imperial habits of power, refreshed by its colossal economic growth, will pull the countries around it back into their ancient role as submissive tributaries." "His portrait of the workings of the Chinese regime---the way the central government has ceded power and control to its immense provinces---helps explain the country's capacity for absorbing contradictions, from the launch of capitalist development zones through the “two systems” takeover of Hong Kong to the mainland's tolerance of, and growing closeness to, Taiwan. His depiction of China's maneuverings to build a commercial and financial sphere of influence in Asia over the past decade conveys Western fecklessness and complacency." Countries play trade games all the time, but this is different. Over the past few years, a new Chinese parochialism has been gaining strength in the Communist Party. Best symbolized by the senior party leader, Bo Xilai, it includes a romantic revival of Maoism, harking back to a time when the Chinese were more unified and more isolated from the rest of the world. It is a reaction to the rampant marketization and Westernization of China over the past 10 years. Bo, who has organized mass rallies to sing old Maoist songs and routinely quotes Mao aphorisms, might well ascend to the Standing Committee of China's Politburo next year on the strength of this new populism. After centuries of isolation, China has grown in power and strength because it opened itself to the world, learned from the West and allowed its industries and society to borrow from and compete against the world's best. It allowed for an ongoing modernization of its economic structures and possibly its political institutions as well. Its leaders Deng Xiaoping and Jiang Zemin understood that this openness was key to China's success. A new generation of Chinese leaders might decide they have learned enough and that it is time to turn inward and celebrate China's unique ways. If that happens, the world will confront a very different China over the next few decades. The Nobel Peace Prize going to prisoner-of-conscience Liu Xiaobo, someone Beijing lobbied hard to keep from receiving the award, is the latest example of how difficult the Communist Party finds it in these robust global times to call the shots with international bodies. Back to the 2008 Olympics and its symbolism, all did not run smoothly, of course, from the Chinese government’s point of view. There were rough spots in even this most successful to date of all Chinese “soft power” spectacles. For example, the torch relay, the longest and most elaborate in Olympic history, was supposed to be a grand symbol of China’s reengagement with every part of the world. In the end, though, only some stops outside of China went as planned. Protesters angered by Beijing’s policies toward Tibet and other issues held demonstrations, some rowdy, to mark the torch’s arrival in cities such as Paris. On the whole, though, domestic and foreign media reports tended to line up fairly neatly once the Games began. The main storyline was that, by successfully mounting such a grand show, China demonstrated howdramatically it had changed and that it was again a central player in world affairs. Such a message was supposed to be carried forward by two subsequent events dubbed “Olympics” of a sort: the prestigious 2009 Frankfurt Book Fair, called an “Olympics for Literature” by Chinese media, and the 2010 Shanghai World Expo, often referred to in China as an “Economic Olympics” or “Olympics of Technology.” If all had gone according to plan, the Frankfurt fair would have generated domestic and international headlines trumpeting the growing profile of Chinese literature and increased respect for China’s cultural traditions. Things began to go wrong for China a month or so before its October opening, when a seminar linked to the event was scheduled to take place including writers who have drawn Beijing’s ire. Poet and dissident-in-exile Bei Ling was among those invited to take part, and so was Dai Qing, the China-based environmental activist whose writings are banned from publication in the PRC. Beijing expressed displeasure at this lineup and called on German organizers of the session to pull invitations to the writers the government found objectionable. At first, fair representatives did an about-face and sought to placate the Chinese government by revoking the invitations, but in the end, the authors came and spoke. The result was a public-relations disaster, as the big story of the fair became Beijing’s ham-handed efforts to limit freedom of speech in an international venue and bully Germany---undermining in basic ways visions of the PRC 2.0 as a country that has become much less ideologically rigid and a more congenial participant in global affairs than was Mao’s China. Flash forward one year, and we see a parallel situation---but with a higher profile in the international news. From Beijing’s point of view, October 2010 was supposed to be a month when the news coverage of the PRC dealt with upbeat topics such as China closing in on claiming record visitors for a World’s Fair---a record that currently stands at 64 million and is held by regional rival Japan for the Osaka 1970 Expo. Readers can find those stories about the Shanghai Expo, of course, but almost exclusively in the Chinese press. The biggest story internationally is Liu winning the Nobel Peace Prize, despite or perhaps partially because of Beijing pressuring the Norwegian committee in charge of the award to give it to someone---anyone---else. Beijing has claimed---in venues such as the Global Times, an English language paper linked to the Communist Party---that Liu’s win reflects anti-PRC “prejudice” and “extraordinary terror of China’s rise and the Chinese model” in the West. However well or badly this rhetoric plays to domestic audiences, to most foreigners it comes across as strident and paranoid and does nothing to help brand China as a modern country. The road from the Opening Ceremonies of August 8, 2008, to this year’s Nobel Peace Prize award has not been smooth for Beijing’s re-branding drive. One common thread in the story of this campaign, though, is that both high points and low points involve global events and new technologies. After all, Liu is in prison not for a paper petition he helped draft and for which he collected signatures from people wielding pens. Rather he was given an 11 year sentence on charges of “subversion” for his role in Charter 08, a bold call for expanded civil liberties intended from the start to be distributed online, via the internet, a new media technology that censors in Beijing work overtime to control, especially at time likes this. Not long ago the same medium was dubbed “God’s gift to China” by an activist and writer once less known but now world famous---Liu Xiaobo. Many scholars and analysts say that China’s belligerence is the result of weak leadership at the top that has left many foreign policy decisions in the hands of the administration and members of the state security and propaganda arms. Henry Kissinger wrote in Newsweek, "China' approach to policy is skeptical and prudent...impersonal, patient and aloof; the Middle Kingdom has a horror of appearing supplicant. Where Washington looks to good faith and good will as the lubricant of international relations, Beijing assumes that statesmen have done their homework, and will understand subtle indirections." The Chinese often "indicate a strong preference, not a condition....To the Chinese, Americans appear erratic and somewhat frivolous." Beijing takes it time making decisions. Kissinger wrote: "The Chinese maneuver to induce their opposition to propose the Chinese preference so that Chinese acquiescence can appear as the granting of a boon to the interlocutor....When faced with what is considered a legacy of colonialism, China is prone to bully in order to demonstrate its imperviousness to pressure. Any hint of condescension or sign that Chinese territorial integrity is nor being taken seriously evokes strong---and to Americans, seeming excessive---reaction." Many feel the best way to persuade Beijing is through quite, private pressure rather than through public upbraiding and humiliation. One Chinese scholar, who has written extensively about the United States, told Time, "If you treat China as a friend, he will treat you well and will never betray you. Treat him like an enemy and he'll fight back without hesitation." When the leaders of China welcome leaders of other nations to China the visits often include a chat with with Chinese President Hu Jintao in front of a huge Chinese painting inside the Great Hall of the People, a 21 gun salute, a stroll before an honor guard and the signing of several deals. The Great Hall of the People meetings are shown repeatedly on Chinese television to reinforce Hu’s status. Spokesmen, though, hide from the domestic and international press. [Except for one] all of the half-dozen current and former spokespeople I've met have declined to give me their contact information besides a general office phone number. Wringing a comment from a government ministry more often than not involves the request to fax a list of questions, which are rarely answered. And when poorly trained spokesmen and officials do speak, PR disasters often ensue. After a high-speed train crashed in Wenzhou last year, killing 40 people, the railway ministry tried to clean up the accident before an official investigation could take place. The railways spokesman claimed, unconvincingly, that this was done to aid rescuers. He told reporters, "Whether you believe it or not, I believe it anyway." The ministry sacked the spokesmen, the fourth ministry official to be fired after the crash, but his remarks only added to public anger and added to grassroots pressure for the government to reform the ministry . China faces a worse PR problem internationally. After the Nobel Committee awarded imprisoned dissident Liu Xiaobo the Peace Prize in 2010, China's Foreign Ministry spokesman called the decision "blasphemy," a response that immediately fueled comparisons between China's response and that of Nazi Germany, when the Nobel Committee awarded the prize to a German dissident. The Western world perceives the Chinese government as unreasonable toward the Tibetans in part because of its officials' tendency to issue tin-eared statements calling the Dalai Lama names like a "wolf in monk's robes." Chinese government officials complain of an anti-Chinese bias in Western media , but the foreign journalists whose reporting shapes Chinese perception almost always have a difficult time getting the Chinese government's side of the story. Government officials and spokesmen rarely give interviews. Chinese dissidents are generally far more media savvy. The Dalai Lama has given hundreds of one-on-one interviews to foreign media. So has dissident artist Ai Weiwei. President Hu Jintao has given none. With the exception of Premier Wen Jiabao, for the past few years neither have any of the other members of the Standing Committee of the Politburo, ostensibly the nine most powerful men in the country. Yiyi Lu, a former Chatham House fellow and expert on Chinese civil society, wrote a paper entitled "Challenges for China's International Communication," due to be published in April. She reports that China's bureaucratic system punish those who make mistakes when talking to journalists but doesn't reward those who say positive things, creating strong disincentive for officials to engage the media. In addition, "spokespersons dare not comment on officials who are more senior than them. Since most spokespersons are middle-ranking officials, it means many topics are off limits," she writes. Things used to be much worse. One of the Communist Party's founding mandates was to "thoroughly break off connection of any kind with bourgeois intellectuals and similar parties.” and the country was closed to outsiders for much of the Mao years. China first appointed a spokesman for the Foreign Ministry in 1983 who held weekly press conferences but didn't allow questions; the second spokesman appeared in the Taiwan Affairs Office in 2000. After being slow to respond to successive PR disasters, like the SARS outbreak in 2003 and the Tibetan riots in 2008, the government has made it more of a priority to try to present its side of the story to the international media, but has yet to set up a functioning system of spokespeople. But instead of focusing on domestic accountability or openness, the Chinese government has been investing heavily in the internationalization of its own TV and news stations, to counter what it perceives to be anti-Chinese bias in the Western media. The state broadcaster CCTV yesterday launched a new program in English called CCTV America, which it says will "project China" to the world. The central government has reportedly committed $6 billionto the global expansion of its state run media. But by allowing its spokesman and officials to actually say something and convincingly present their side of the story would go a long way to countering perceived media bias.